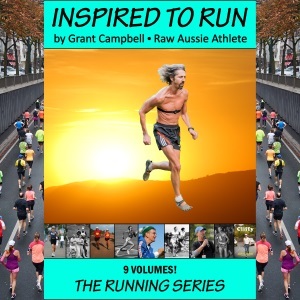 Inspired to Run is a 9-volume series of books which share the wisdom of great running coaches and inspirational runners of all levels and disciplines. Overflowing with inspiring running quotes and empowering running resources, and rich with photos, profiles, and stories of inspiring runners and running coaches, a quick read of “Inspired to Run” will have you out running in no time, with passion, purpose, joy, and a deeper connection with the true essence of running! The “Inspired to Run” series is the holy grail that whispers the answer to the timeless question, “Why do we run?”. Each book in the series focuses on a unique perspective of running. There’s a book of success stories. There are books on sprinting, middle distance, long distance, and ultra distance running, and books on jogging, training and racing. There is even a book for the health conscious runner! Warning: Reading the “Inspired to Run” series will awaken your passion for running, leaving you inspired for a lifetime. Once a runner, always a runner!